Heather Evans Smith’s work is still but spirited in all her pieces. A vintage feel falls upon Smith’s photographs, no matter the portfolio you are viewing. Along with the title, Seen Not Heard plays along with the antique theme throughout her imagery. From the cover, Carrie Violet provides illustrations to the child-like whimsy that can be seen through Smith’s daughter’s modeling with a spool of thread and a needle and a locket with a flower inside. Showing the bond of youth and experience, Smith demonstrates the process of teaching her daughter the ropes in what would be viewed today as a non-traditional aspect. Seen Not Heard is derived from the old saying that children should be seen and not heard. Throughout the book, the pure silence of Smith’s daughter emanates from the photographs. 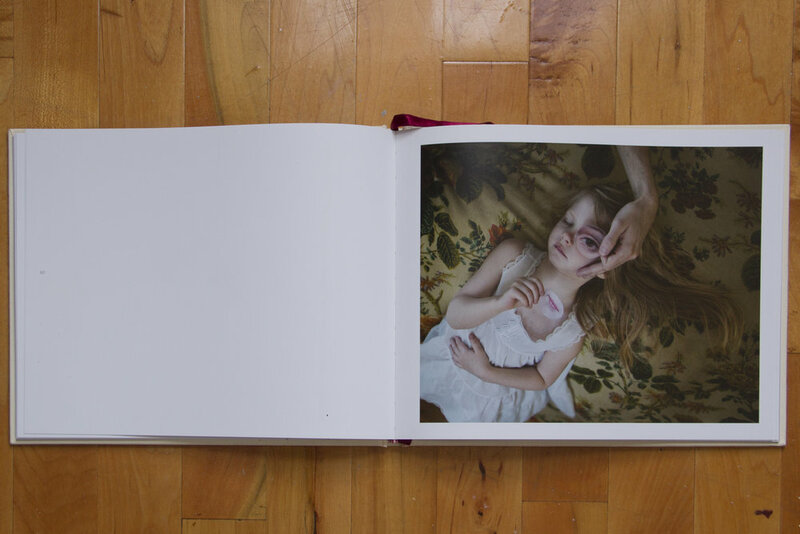 Showing images of how a typical female should be raised, Smith has captured her daughter putting on ballet tights, picking petals off a flower, and getting her hands in a pile of dirt, also known as common things children are expected to do. While flipping through the photos, you are drawn in by the displays of differing floral patterns and clothes you would not see children in 2017 wearing. The deep saturation and youth in every photograph is simply mesmerizing. Another detail that can be noticed, for those familiar with Smith’s work, is the similarity she carries through from previous portfolios. In photographs featured in Domesticated and The Heart and The Heavy, Smith features parts of her face covered by cutouts of other mouths and eyes. In Seen Not Heard, Smith’s photograph “Mold Me” shows her daughter lying down with, what is implied to be, Smith’s hand holding an eye cutout over her one closed eye and her daughter holding a cutout of a pair of lips. Also another common theme amongst Smith’s work is the olden theme in terms of clothes and color choice. Plenty of lace and feminine elements that covers in the places that back in the day, a woman should have covered. Seen Not Heard lives up to the title remarkably well. The relationship between mother and daughter, the detail of color and clothing, all of this and the illustrations scattered throughout tie it all together to create a classical feel of quiet, well-behaved children. The bond between both herself and her daughter also proves to be strong with every flip of the page. Smith’s photographs create a new look on old traditions. It’s soft, it’s silent, and it’s beautiful. If you are interested in purchasing Seen Not Heard, you can purchase it on the Fraction website.